Olde Main Brewing Co. & Restaurant is a locally owned restaurant and brew pub located in the heart of the Downtown Ames Cultural District. Olde Main offers handcrafted entrees, fresh brewed beer & "Red Monkey" root beer, served in a casual atmosphere. The Restaurant seats more than 250 people in it's 2 level dining area and is a perfect location for business lunches or dinners, rehearsal dinners, anniversaries, bridal showers and class reunions, just to name a few. There is a private Board Room for meetings or presentations that seats up to 12 and features a custom crafted 9' round table and comfortable captains chairs. If it's off-site catering you're interested in, consider Olde Main as an option!! 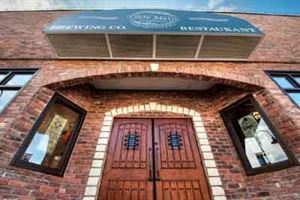 Olde Main Brewing Co. & Restaurant...."Feeding Your Expectations"
The Board Room features a 9' custom crafted round table and comfortable leather captains chairs, seating up to 12 people. It is available for morning, afternoon or evening meetings. Please call to book your next meeting! Special Features: Television with vhs/dvd/memory stick capabilities. SVideo cable to present power point presentations through the TV. Built in sound system, satellite and Wireless Internet. White screen available for an additional charge.